Full body tracking is supported with Perception Neuron up to 32 bones. Perception Neuron is supported in Humanoid Control Pro. Perception Neuron with up to 32 neurons is supported. Make sure Perception Neuron support is enabled. 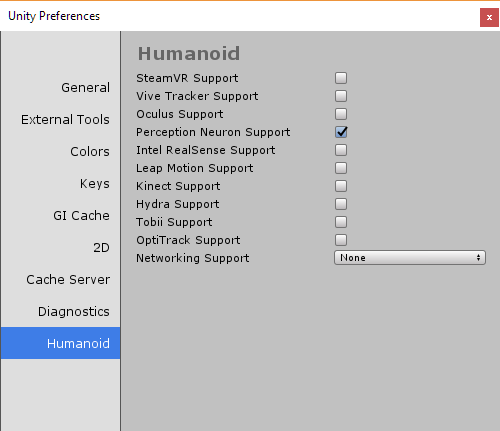 Go to Edit Menu->Preferences->Humanoid and make sure Perception Neuron Support is enabled. Disabling Perception Neuron support ensures that no code related to Perception Neuron is included in the build. Axis Neuron software is required to support Perception Neuron. In the Settings-Broadcasting, make sure that BVH is enabled in Binary format, without Use old header. ServerPort needs to be set to 7001. The protocol needs to be set to TCP. To enable Perception Neuron tracking for an avatar, Perception Neuron needs to be enabled in the Humanoid Control component. The Address should match the IP address of the computer running the Axis Neuron software. The Port and Protocol TCP/UDP should match the settings in Axis Neuron as described above. Neuron can be enabled separately for the head, hand, hips and foot targets. Disabling Neuron on one of these targets will disable tracking of the complete body part associated to that target. E.g. the hand will control the full arm including the shoulder. Finger movements can be tracked directly from the Neuron sensors on the hand.